You can type text messages to your friends in an instant message (IM) or within a chat room. You can also send 'emotes' and 'stickers'. You will see the text entry area at the bottom of every Instant Message (IM) and chat room panel. Click your mouse into the area that says 'write a message'. Type your message and then press the 'enter' key on your keyboard to send the message. Your message is not sent until you press the enter key. 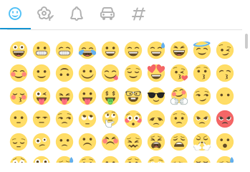 Click on the 'smiley face' icon to bring up the emote panel. There are lots of emotes available. On the top of the emote panel you will see various 'tabs'. Click on different tabs to select different emote panels. When you find the perfect emote, click on it with your left mouse button to select it. To the right of the 'smiley face' icon you see a semi-circle with the top edge peeled back. This is the 'stickers' icon. Click on it to bring up a panel that contains whatever sticker packs you have. Use the tabs to change between sticker packs. Click on the sticker you want with your left mouse button to select it. Next in line is the 'paper clip' icon. Click on the paper clip to send a file or a snapshot from your camera. If you select 'send a file' you can browse your computer, select a file, and then send it. If you 'send a snapshot' your camera will become active and you can take a snapshot and send it.